Just a reminder of our upcoming Community Chat, this Thursday from 9 am until 11 am. This will be held at Woodbridge Cafe. 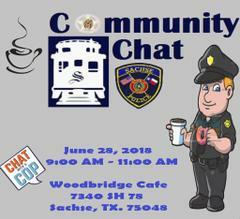 Come sit down, enjoy breakfast, or a cup of coffee with a few of your Sachse Police Officers. See you there!